If you have read my blog for any length of time, you’ll know that I am always on the lookout for good kid appropriate horror. 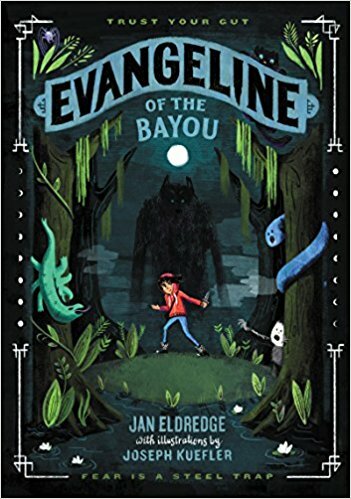 Evangeline of the Bayou totally fits the bill. I love all the folklore that Jan is able to pull into the novel. Her descriptions actually have me wanting more, in a good way. I want to go on every single hunt with Evangeline and her Grandma to see how each baddie–big and small–is handled. I hope that there will be a sequel. Joseph Kuefler’s black and white illustrations throughout the book are fun and add a bit to the creep factor without going overboard. I feel like Evangeline’s character is relatable, especially to the target age group. That is what makes the book so great. Growing up, living up to expectations–both internal and external, death, and loss are all artfully intertwined into a story about a young girl fighting monsters. What is not to like? One thing that I give total props to Jan for is getting me with a few twists. I usually have things all figured out by the end, but she got me. I tip my hat to you, Madam. I would definitely recommend this to anyone who enjoys folklore, spooky stories, or just great storytelling.